Shao Mai (Shumai) is another well loved dish in China. Its thin wrapper is made from unleavened dough, and the filling can be pork or shrimp. 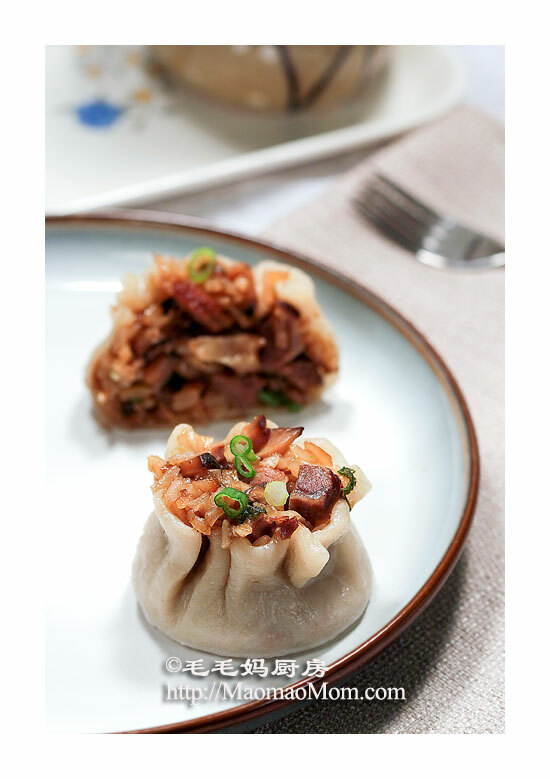 This recipe is from Jiang Nan (the region south of the Yangtze River), where the glutinous rice is widely used. This is different from the Cantonese Shumai served in dim sum, which are smaller and have thinner wrappers. The traditional filling uses pork belly. When steamed, the fat melts and mixes with the glutinous rice making the Shao Mai moist and flavorful. When I make them for my family, I use pork hocks to cut down the fat. They quickly became one of my son Maomao’s most favorite food. 8) 1 cup boiling water (235g), 1 tbsp cold water, 2 tsp corn oil. 1: Glutinous rice: In a medium size saucepan, boil 1.5 cups water. Add 1.5 cups glutinous rice, stir then cover the lid. Cook at low heat for 35 minutes. Set aside (Picture1). 2: Cut pork hocks into 1-inch cubes. Place meat in InstantPot pressure cooker, fill with boiling water (picture 2), select “Sauté” function on “High” for 2 minutes, drain and rinse off. Put meat back into the InstantPot, add all ingredients of Ingredient 3) and 4) (picture 3). Cover the lid and place the pressure valve to “Seal” position. Set 38 minutes on “Manual”. When the program is done, wait another 5 minutes. Slowly release the pressure then open the lid (picture 4). Press “Sauté” on “High” to reduce the sauce to about 1/4 of the volume while stirring the meat. Take out the cooked meat and dice into small pieces. Place the meat in a bowl with the sauce. 3: Filling: Non-stick frying pan on medium-high heat, heat 2 tbsp olive oil, add 3 tbsp chopped green onion (Picture 5) and stir fry for 30 seconds. Add diced mushroom and stir fry for a minute (Picture 6). Add cooked rice and stir a few times (Picture 7). Put in the diced pork with sauce and the remaining ingredients of Ingredient 6). Mix well (Picture 8) then remove from heat; set aside to cool. 4: Wrappers: Add 2 cups of unsifted all purpose flour in a bowl. Slowly stir in 1 cup boiling water (Picture 9). Continue to stir until water mixes well with flour (Picture 10). Wait for a couple of minutes, then add 1 tbsp cold water to form soft dough. Add 1 tsb corn oil and continue to knead for 2 minutes until it forms a smooth ball (Picture 11). Cover with a damp cloth and let it stand for 30 minutes. On a floured working surface, divide the dough into 2 equal portions. Cover one portion with dump cloth while working on the other. Shape the half dough into a roll that is 12 cm long. Cut into 1 cm pieces. 5: Shao Mai: Roll each piece out into a circle 9-10 cm in diameter that is thicker in the middle and thinner on the edges. Place 2 tbsp of filling in the middle of each wrapper (Picture 12). Gather the edges of the wrapper over the filling and squeeze the sides together at the top 1/3 to form a pleated cup, leaving the filling exposed on top (Picture 13). Repeat with the remaining 23 wrappers. Cut parchment paper into 2.5-in squares and place Shao Mai on top. Place them inside a steamer pot (Picture 14) over high heat. Bring water to a boil then steam Shao Mai for 7-8 minutes. 6: Serving: Serve immediately. Yummy!! Tips: Leftover Shao Mai can be stored in an airtight container in the freezer for up to 4 months. Prior to serving, defrost Shao Mai overnight in the fridge, heat in the microwave oven for 45-50 seconds until rice turns soft. This entry was posted in Appetizer, 点心, 特色小吃 and tagged Breakfast Dinner, Chinese Mushrooms, Cinnamon Stick, Cook Time, Cooking Wine, Corn Oil, Dark Soy Sauce, Glutinous Rice, Green Onion, Inch Cubes, Jiang Nan, Light Soy Sauce, Place Meat, Pork Belly, Pork Hocks, Purpose Flour, Star Anise, Tbsp Cold Water, Thin Wrapper, Yangtze River. Bookmark the permalink. For 糯米肉烧卖, could you please let me know the 红烧蹄膀 you used with the skin or not? Thank you very much for getting back to me! Have a great weekend! You too, have a great weekend. Just a quick question: can the shaomai be frozen before they are cooked? Or better after they are cooked? I usually cook them first then freeze. I think you can freeze first then steam them later.